If you are thinking of getting on the saddle and cycling to school, there are several things to keep in mind to ensure your ride is pleasant and safe. The first thing is to familiarise yourself with local laws on cycling. For example, are there dedicated bike lanes or are you allowed to cycle on busy or main roads? Wherever you cycle, some universal laws are standard to safeguard your wellbeing. Prepping your bicycle is necessary to ensure that it is visible to other road users and that it meets safety standards. From a technical point of view, make sure that brakes work and the handlebar steers properly. You should also fit your bicycle with lights and reflectors in appropriate places such as pedals, wheels and the back. As a cyclist, helmets and high visibility clothing are recommended. Whilst on the road, act like a vehicle by indicating turns with hand signals and following traffic lights. More information on how to ride a bike safely is found in this article. We want to encourage students to cycle to school and to be safe when doing so. For this reason, any student who cycles to school (even if only occasionally) must hold an up-to-date cycle permit, which is renewed annually and which must be carried by the student when cycling to and from school. Any contravention of the Cycling Safety Code (shown below) could lead to the permit being withdrawn. In the case of a student arriving or leaving without a helmet, they may not be allowed to take their cycle away from the school site even if they insist that they are walking it home (it will be stored securely). The cycle MUST be in a roadworthy condition. 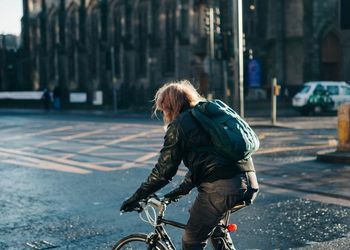 The student MUST cycle in a SAFE manner and show consideration for other road users and pedestrians. The student MUST wear a cycle helmet in the approved manner. It should be noted that the school cannot accept responsibility for the security of cycles on school premises and we strongly advise that your son/daughter has a good quality lock for their cycle (ideally a solid D-lock). We are currently liaiseing with our local police team to offer options for increasing security (including discounts on locks and security tagging) and we will be in touch shortly regarding this. To apply for this year’s permit please click here. Even if your son/daughter has held a cycle permit previously, we would be grateful if you would still complete the online reply slip, after which he/she will need to visit the Year Office to obtain a replacement permit for this academic year, as it is important that we have an up-to-date record of who is cycling to school.